RECENTLY, OUR WORLD LITERATURE TEACHER GARRETT AUSTEN introduced his tenth grade students to the literary genre known as the epic poem. Originating in Ancient Greece, (think The Illiad), the epic poem centers around a single hero and proceeds to tell a lengthy story detailing his adventures. While the volume of epic poems being produced has died down over the last one hundred years, the genre flourished in Argentina during the 1800’s through such works as José Hernández’s 2,316 line Martín Fierro. In Martín Fierro, José Hernández writes about the gaucho Martín Fierro, a recently conscripted cowboy who lives on the South American plains known as the pampas. Using an eight syllable style that is commonly paired with a guitar in the region, Hernández tells the story of of Fierro’s numerous exploits living in the Argentinean version of the “Wild West”. Unruly beasts he used to tame. A meaty woman on his thigh. Martin Fierro was his name. 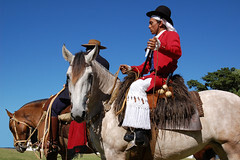 the gaucho thinks to hone his knife to prepare for his gaucho strife. the gaucho sings his gaucho life. Defending his home at the least. Together they left in a pack. for protection, without a sack. and locks it behind iron bars. Martin Fierro sings his plea. Our gaucho’s misfortunes were played. His name Martin Fierro it’s said. Relief as Martin Fierro ran.